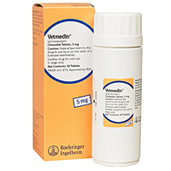 Shop for medications to treat your dog's congestive heart failure at VetDepot.com. Congestive heart failure, or CHF, is a potentially fatal condition in dogs caused by a functional or structural abnormality of the heart. In dogs with the condition, the heart cannot pump adequate amounts of blood throughout the body. In severe cases, fluid accumulates in the chest, abdomen, or other areas. "Fortunately, most dogs that obtain treatment for CHF live full, active, and happy lives"
Congestive heart failure in dogs has a variety of causes, including heart valve degeneration, heartworm disease, heart muscle disease, and arrhythmias. 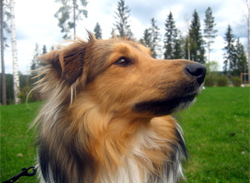 Although the condition is most common in older dogs, it can develop in dogs of any age. Without treatment, CHF can quickly lead to death. Prompt treatment can prevent complications and prolong life. While not all dogs will experience all symptoms of the condition, some symptoms are common to most dogs. These symptoms, which usually include coughing, breathing difficulty, fatigue, shortness of breath, and exercise intolerance, are often the only clue to the condition's existence. When symptoms are present and other causes of those symptoms have been eliminated, your veterinarian may perform chest x-rays, blood tests, and a complete physical examination of your dog to determine whether his heart is working properly. An echocardiogram, which is a heart ultrasound, and an electrocardiogram help confirm the diagnosis of congestive heart failure. Treatment of congestive heart failure depends on the underlying cause of the condition. Your dog's age and overall health may also be factors when your veterinarian is designing a treatment plan for your dog. In most cases, the heart failure cannot be cured; however, treatment can improve heart function, prevent or slow additional heart muscle deterioration, prevent retention of fluid, and prolong your dog's life. The first stage of treatment generally involves stabilization of your dog's condition. Hospitalization to provide intravenous medications and supplemental oxygen may be necessary. Accumulated fluid may be drained with a needle in a procedure called thoracocentesis. 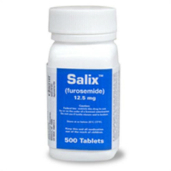 Once your dog is cleared to go home, he may need to take an oral diuretic, such as Salix, to prevent additional fluid accumulation. An angiotensin converting enzyme inhibitor, or ACE inhibitor, and/or a positive inotrope medication may also be necessary to dilate blood vessels and improve the heart's functioning. To improve your dog's prognosis and help manage his symptoms, you may want to supplement with L-carnitine or taurine. Your dog may also require a low sodium diet and frequent monitoring of his condition for the rest of his life. Fortunately, most dogs that obtain treatment live full, active, and happy lives.